Opal Tower, a prestigious 30-storey building just launched at Sydney Olympic Park, has redefined apartment living, with their spacious and comfortable apartments. The four bedroom ‘skyhomes’, were designed specifically for families who want more spacious and gracious living, capturing a spirit of sophistication with stunning entertaining and living areas finished in refined detail. Displaying some of the best views in Sydney – north over Homebush Bay to Chatswood, east to the Sydney CBD, and south over Bicentennial Park and Lake Belvedere, each skyhome is 120 metres above ground level with a 185 square metre floor plan. Developer Ecove's Marketing Director Sue Ballesty said she had designed the skyhomes for family, defying the push by State Governments towards ‘micro apartments’. “There is little difference in space and creature comforts to a house, but these apartments free the family from external maintenance chores, allowing more quality time together. “Most importantly, they are in a vibrant location where no houses exist," she said. In the spacious skyhomes within the Opal Tower, all bedrooms easily fit a king-size bed with plenty of space to spare, with an additional large spacious living room, two bathrooms, a study and two car spaces. “Living at Opal Tower will be a balance between the excitement and activity of Sydney Olympic Park with the peace and privacy of having Bicentennial Park as your front yard,” said Ms Ballesty. 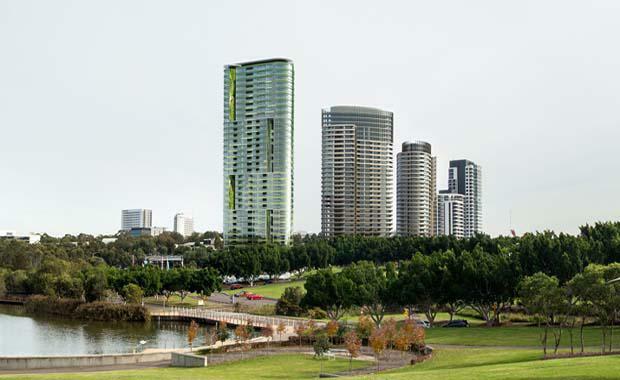 Opal Tower is an environmentally-sound and ecologically-effiecient building, with a series of dramatic vertical feature walls that will be connected via a new bridge and underpass to Bicentennial Park. Phillip Vivian Director of Bates Smart, who designed the Opal Tower said the building will be the next generation of environmental apartment living at Sydney Olympic Park. “Environmentally, the design cleans, filters and cools air to apartments and common areas, provides cross ventilation, shade in summer and sunlight in winter. Opal Tower is the fourth and most prominent residential building from developer Ecove along Australia Avenue. The residential population of Sydney Olympic Park is forecast to reach 14,000 by 2030, with Ecove listing three factors fuelling the strong demand – location, a large permanent workforce, and handy public transport. “The influx of residents has made Sydney Olympic Park into a fully functioning suburb,” Ms Ballesty said . “There is a real sense of community here, and residents appreciate the benefits of living in the sporting and entertainment heart of Sydney.